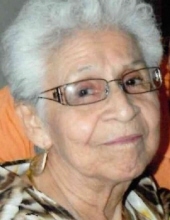 Stella Perez Leal was born in San Antonio,Texas on June 19, 1921 to Nicolas and Rosa Perez. She passed away to be with our Lord on February 9, 2019 in Kingsville, Texas surrounded by family. She is preceded in death by her husband, Jesus Jaime Leal; daughter, Stella Leal Casillas; son, Roland (Linda) Leal; and numerous siblings. Stella is survived by her brother, Eduardo (Connie) Perez; sister-in-law, Dora Leal; grandchildren, Amanda (Richard) Gallegos and Lisa (Adrian) Martinez; great-grandchildren, Marissa, Ricardo, Daniel, Duncan, and Lilliana. Stella was an avid bowler. Her team, the Happy Rollers, were in the Greater San Antonio Bowling League, U.S.B.C. She will be greatly missed and forever in our hearts. To send flowers or a remembrance gift to the family of Stella Perez Leal, please visit our Tribute Store. "Email Address" would like to share the life celebration of Stella Perez Leal. Click on the "link" to go to share a favorite memory or leave a condolence message for the family.